Bradley Beal has had an exciting summer. He still is living out in St. Louis and has been spending the past month travelling between Las Vegas, St. Louis, and Washington, DC. Whether it be to hang out with 2 Chainz, to signing expensive memorabilia, to playing in the Summer League, Beal has been flying all the time. Every time he flies anywhere Beal makes sure to let Twitter know. When he gets to the airport he tweets "#AirportFlow". When they tell him to turn of his phone on the plane he tweets "#WheelsUp". And something that really tilts me is when he lands he tweets "touchdown in DC". Yep you are reading that right. Touchdown! Like in football. Not touched down like an airplane. Drives me crazy. 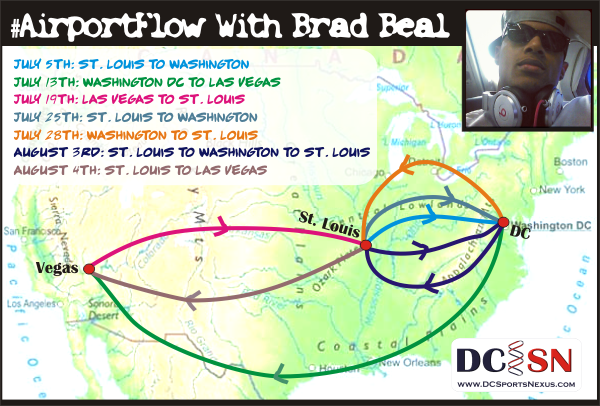 Anyways, I've created a nice little picture so you can see all of Beal's travels over the last month. Enjoy #AirportFlow The Image at the top of the story. Bradley Beal's Autograph Video Is Mesmerizing!